"The grass on the rock, the flower of the heath, the thistle with its beard are the chief adornments of his landscape."Ossian. 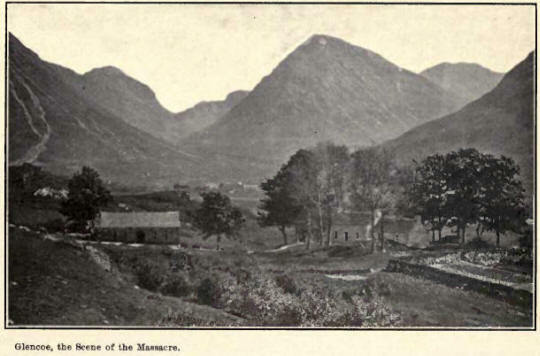 THE romantic scenery of the Scottish mountains, their rugged wildness, their indescribable loveliness and charm when clothed with all the autumnal embellishment of their blossoming purple Heather, although existing throughout the ages, have only been known to travelers a little over a century and a half. It is generally believed that the beauties of the Highland scenery were first brought prominently before the world by the publication in the year 176o of what the author, MacPherson, entitled "Fragments of Ancient Poetry Collected in the Highlands." Geikie tells us that previous to the Jacobite rising the mountainous region was regarded as the bed of a half savage race into whose wilds few lowlanders would venture without the most urgent reasons. The poet Gray, during his visit to Scotland in the year 1765. made a brief excursion into the Perthshire Highlands, and except for the discomforts of travel at that time, came away with a vivid impression of the grandeur and beauty of the scenery. Writing to Mason, he says: "The lowlands are worth seeing once, but the mountains are ecstatic and ought to be visited in pilgrimage once a year. None but those monstrous creatures of God know how to join so much beauty with so much horror." Yet these fair mountains failed to appeal to or arouse the admiration of some writers and travelers who have viewed them. To Dr. Johnson, for instance, they possessed but little charm. "Of the hills," he says, "many may be called with Homer's Ida abundant in springs; but few can describe the epithet which he bestows upon Pelion, by waving their leaves. They exhibit very little variety, being almost wholly covered with dark heath, 2nd even that seems to be checked in its growth. What is not heath is nakedness a little diversified by now and then a stream rushing down a steep. it will readily occur that this uniformity of barrenness can afford little amusement to the traveler, that it is easy to stay at home and conceive rocks and heaths and waterfalls, and that these journeys are useless labors which neither impregnate the imagination nor enlarge the understanding." Every Scot can read with amusement the doctor's characterization of what is conceded the country's greatest charm, when he remembers that for all things Scottish the gnat lexicographer had an utter contempt, unless it may have been Scotch broth. Burt, in his 'tettes-s from a Gentleman in the North of Scotland," says: "There is not much variety but gloomy spaces, different rocks, heath and high and low— ' the wild and the dismal gloomy brown drawing upon the dirty purple, and most of all disagreeable when the Heather is in bloom,"
Contrast the foregoing with sonic of Sir Walter Scott's unrivaled pen portraits of the majestic grandeur of Scottish scenery! Where the fire of the poetic genius is wanting, or where exists the lack of enthusiastic appreciation of Nature's most sublime handiwork, one can well conceive of a production so dull and urn interesting as Burt affords. To her late Most Gracious Majesty Queen Victoria the mountains of Scotland, and their infinite charm, were a never-ending source of delight. 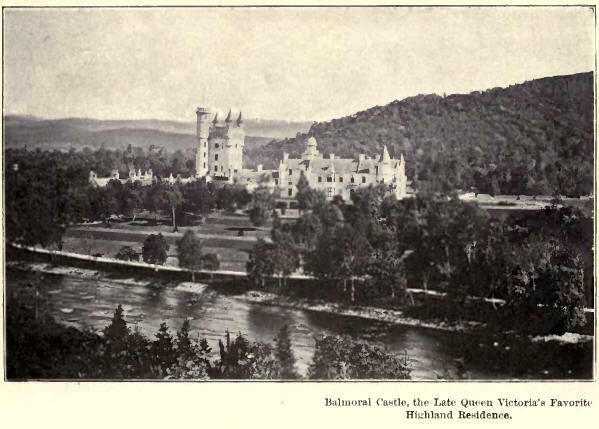 Her Majesty's unique works, "Leaves From Our Journey in the Highlands" and "More Leaves," abound in passages portraying the impression made by the Scottish scenery upon the late Queen. Writing of the trip through the Clachan of Aberfoyle, she says: "Here the splendid scenery begins—high, rugged and green hills (reminding me again of Pilatus)—very fine large trees and beautiful pink Heather, interspersed with bracken, rocks and underwood, in the most lovely profusion, and Ben Lomond towering up before us with its noble range." Again: "Altogether the whole drive along Loch Aid, and then by the very small Loch Dow and the fine Loch (Ion, which is very long and lovely, the Heather was in full bloom, and of the richest kind, sane almost of a crimson color and growing in rich tufts along the road." And perhaps one of the grandest tributes ever paid to Scotland and her people has been penned by Queen Victoria in the following words which occur in her description of Loch Lomond and its enchanting environments: "This solitude, the romance and wild loveliness of everything here, the absence of hotels and beggars, independent simple people who all speak Gaelic here, all make beloved Scotland the proudest, finest country in the world. Then there is that beautiful Heather which you do not see elsewhere. I prefer it greatly to Switzerland, magnificent and glorious as the scenery of that country is." And amid russet of heather and fern. Among the many tributes of tender sentiment cherished by the laze Queen Victoria, stored any in her private album, was a spray of Heather, "which," says Helene Vacaresco, the Roumanian poetess and Maid of Honor to the Queen of Roumania, "was taken from the wedding bouquet presented by Prince Albert to his wife,"
"But a Highland landscape is of itself sufficiently beautiful. It merely requires Heather to give it the predominant tone and to interest the beholder by means of many associations sure to suggest themselves when he sees the purple bran. Take, for instance, the valley of Carry in mid-July. It possesses a charm of its own, and yet Scotland owns a thousand more valleys which to a casual observer appear very similar when they are flooded with Heather bloom, such is the magic of this humble shrub. The prevailing colors in the open country on either side of the Garry arc reds and purples, derived mainly from Heather, largely reinforced by clover and vetches. 'These tints are set off by the flaunting blossoms of the broom on every neglected corner, while the tender waxen Erica tetralix gathers round the head of each mimic burn that cleaves the moorland. Every here and there are batches of turnips, while above them on the crags and below toward the waste spots an ocean of Heather surges in like a flood tide swallowing up as it were one by one the numberless great black trap boulders which are piled up in confusion, the gravestones of a long buried world, and among which tower foxgloves of great size and beauty. Above tower many huge spruce firs like giants with drooping robes of green that love to sweep the earth. Some of them have lost their lead, but another soon takes its place and the disfigurement is speedily unnoticed in the clouds of foliage high up, its light green tips all drenched in sunshine. Behind them the mountains break away into the skies, their shoulders covered with spires of young larch, while graceful birches come down the foreground intermixed with the heavy hanging sprays of beech like mountain nymphs which have left their stem seclusion to draw near to man. In the valley the bracken catches the sun's rays and midst its glitter the Garry may be discerned of the color of straw with boulders shining through its stream, like masses of cairngorm when seen in the shade. Rain has fallen amongst the mountains during the night, and now the trees shake their leaves over the stream as it roars underneath, and the foxgloves near it dance in the echoes, and a thousand little burns running into it trickle everywhere, through the lichen-spotted boulders. What more typical picture could be selected for a wild prospect of Highland Heather?" The Rev. Hugh Macmillan affords us another picture: "How gorgeous is that miracle of blossoming when summer, with her blazing torch has kindled the dull brown Heather, and every twig and spray burst into blushing beauty, and spread wave after wave of rosy bloom over the moors, until the very heavens themselves catch the reflection and bend enamoured over it with double loveliness." Mr. Macmillan also furnishes this delightful description of a sunset on Ben Lawers: "Never shall I forget that sublime spectacle; it brims with beauty even now in my soul. Between me and the west that glowed with unutterable radiance, rose a perfect chaos of wild, dark mountains, touched here and there with reluctant splendour by the slanting sunbeams. The glowing defiles were filled with a golden haze, revealing in flashing gleams of light the lonely lakes and streams hidden in their bosom; while far over to the north a fierce cataract that rushed down a rocky hillside into a sequestered glen, frozen by the distance into the gentlest of all gentle things, reflected from its snowy waters a perfect tumult of glory. I watched in awestruck silence the going down of the sun, amid all this pomp, behind the most distant peaks—saw the fiery clouds that floated over the spot where he disappeared fade into the cola dead color of autumn leaves, and finally vanish into the mist of even—saw the purple mountains darkening into the Alpine twilight, and twilight glens and streams tremulously glimmering far below, clothed with the strangest lights and shadows by the newly risen summer moon." In "Gray Days and Gold" we find that charming writer, William Winter, the impressionable and discerning poet-critic of the American theater, thus characteristically voicing his awe of these Scottish mountains: "Brown with bracken and purple with Heather,* * * still with a stillness that is awful in its pitiless sense of inhumanity and utter isolation. It would be presumption to undertake to describe the solemn austerity, the lofty and lonely magnificence, the bleak, weird, haunted isolation, and the fairy-like fantasy of this poetic realm. * * * The mountain road, on its upward course, winds through treeless pastureland, and in every direction, as your vision ranges, you behold other mountains equally bleak save for the bracken and the Heather, among which the sheep wander and the grouse nestle in concealment, or whirr away on frightened wings." And again, in "Brown Heath and Blue Bells:" "The Heather was pink on the sides of the hills and over their grim tops the white mist was drifting, and in the tender light of morning the Highlands looked their loveliest when I bade them farewell"
Scotland's loyal sons have sung their country's superiority over all other lands, and have especially emphasized her superlative scenic characteristics, through the medium of their much-loved mountain flower. How lovely her lakes, and her valleys how blooming. And fragrant hills of purple Heather. Wi' tints o' gowd and green. And hurrah, my merry men! For a' the lands I ken. An' kiss our sparkling fountains. Oh! what is Scotland's greatest pride? Lochs, isles, and dark woods spreading wide? Nay! 'tis her glorious mountains! 'Mong yellow whins and brackens green, Or fragrant purple heather. Where the red blooming heather and hair-bell abound? Her heather is blooming, her eagles are free. That such wild grandeur should have an influence upon those whom it constantly surrounds is a natural sequence. This pervading influence is delightfully impressed by Ruskin in the following passage from "Two Paths:"
"You will find upon reflection that all the highest points of the Scottish character are connected with impressions derived straight from the natural scenery of their country. No nation has ever before shown, in the general tone of its language—in the general current of its literature—so constant a habit of hallowing its passions and confirming its principles by direct association with the charm or power of nature. The writings of Scott and Burns—and yet more, of far greater poets than Bums, who gave Scotland her traditional ballads—furnish you in almost every stanza—almost in every line—with examples of this association of natural scenery with the passions; but an instance of its farther connection with moral principle struck me forcibly just at the time when I was most lamenting the absence of art among the people. In one of the loveliest districts of Scotland, where the peat cottages are darkest, just at the western foot of that great mass of the Grampians which encircles the sources of the Spey and the Dee, the main road which traverses the chain winds round the foot of a broken rock called Crag or Craig Ellachie. There is nothing remarkable in either its height or form; it is darkened with a few scattered pines and touched along its summit with a flush of Heather; but it constitutes a kind of headland, or leading promontory, in the group of hills to which it belongs a sort of initial letter of the mountains, and there stands in the minds of the inhabitants of the district the clan Grant, for a type of their country and of the influence of that country upon themselves. Their sense of this is beautifully indicated in the war cry of the clan, 'Stand fast, Craig Ellachie.' You may think long over those few words without exhausting the deep wells of feeling and thought contained in them—the love of the native land; the assurance of their faithfulness to it; the subdued and gentle assertion of indomitable courage—I may need to be told to stand, but if I do, Craig Ellachie does. You could not but have felt, had you passed beneath it at the time when so many of England's dearest children were being defended by the strength of heart of men born at its foot, how often among the delicate Indian palaces, whose marble was palled with horror, and whose vermilion was darkened with blood, the remembrance of its rough gray rocks and purple heaths must have risen before the sight of the Highland soldier; how often the hailing of the shot and the shriek of battle would pass away from his hearing, and leave only the whisper of the old pine branches—. 'Stand fast, Craig Ellachie.'"